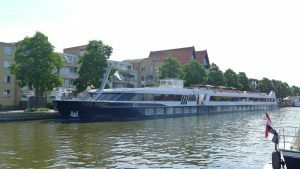 Will your cruise ship, party, river or tour boat, barge or skûtsje moor in Friesland? Frisian Guide Agency gladly provides short or longer shore excursions for your guests. You can book us to step on board or for a city/village walk. But if needed we can also offer a coach tour in the surroundings accompanied by our skilled guides. We adapt our routes to match your schedule and take care that everyone is back on board on time. We gladly hear about your plans to visit Friesland and think along for an attractive excursion program for your guests. Feel free to contact us for more information or an obligation-free offer.